(like e.g. various leaf salads, root products, etc.) but also fruit like apples and grapes achieving germ reduction and prolongation of shelf life and, consequently, increase of quality of products. Soft inflowing of product: The product enters gently into a pipe system without passing through a pump. Chemicals and sanitizing products can be added at different stages of the product transportation through the machine. At the discharge, the product is rinsed with fresh water through special nozzles placed on top of the exit conveyor belt. Flexible dwell time – product-friendly treatment step: Flexible contact and dwell time of the produce is adjustable from 1 to 3 minutes. Length of the piping system can be adapted to dwell time (e.g. between 60 – 180 sec.) according to individual customer requirements. 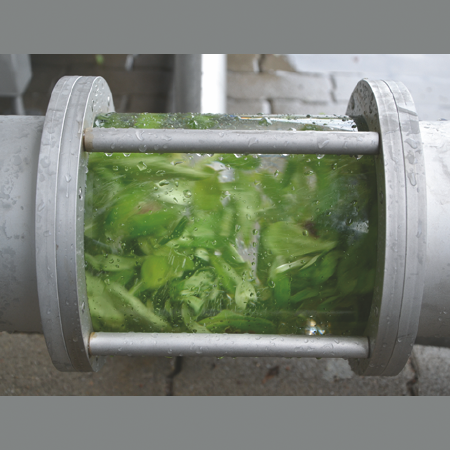 Optimal integration into processing lines: The modular and space-saving tubular system can easily be integrated into existing salad processing lines, various installation layouts for customer specific conditions are possible. Simple cleaning: For mechanical cleaning the pipelines can be disassembled easily and quickly by means of screw connections. Optional dosing station: To dose and control suitable additives for product treatment in the water cycle. 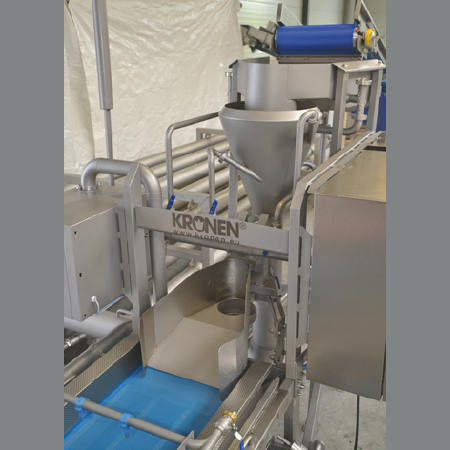 Pre-washed product will be flushed gently and reliably into the system by water coming out of lateral rotation nozzles. The product is flowing through the piping system (inside diameter 150 mm) in a laminar stream to the outlet. This treatment step is, therefore, very product-friendly. 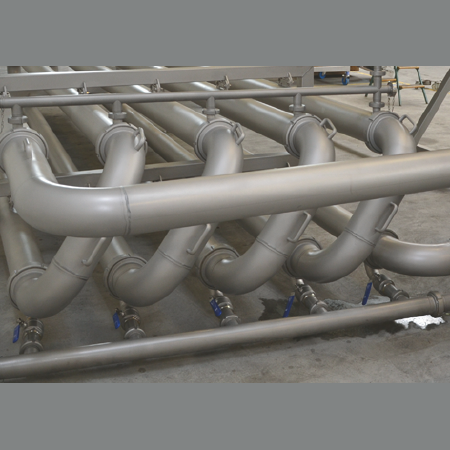 The water flow velocity within the tube system depends on the amount of supplied water and produce.Length of the piping system can be adapted to dwell time (e.g. between 60 – 180 sec.) according to individual customer requirements. The product passes through the piping system without using additional pumps. Depending on product and desired dwell time the frequency controlled pumps can be perfectly adjusted. In addition, the water flow can be adapted by ball valves at the Vortex inlet. Depending on the desired application the treated product will be delivered onto a vibration table or an outfeed belt. 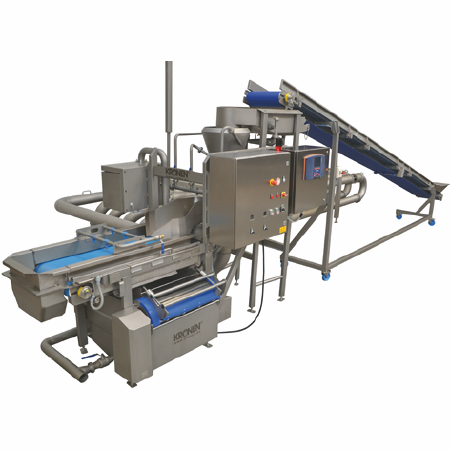 The modularly built and space saving Vortex line can simply be integrated into existing processing lines and adapted to customer-specific requirements. Customized layouts will meet your needs. 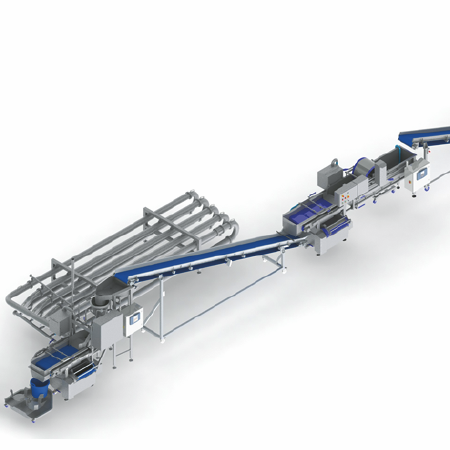 The Vortex-line can also be used as a closed transport system between two processings steps or two processing lines. 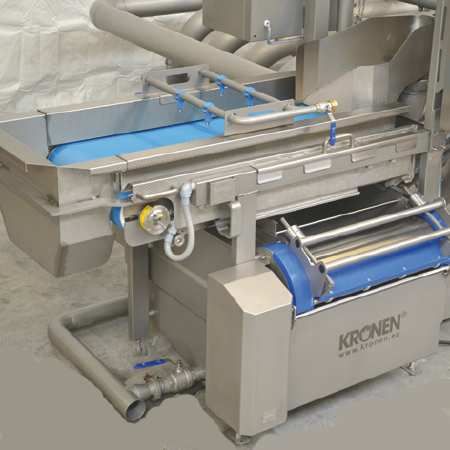 For mechanical cleaning the pipelines can be disassembled easily and quickly by means of hygienic dairy couplings.